Meet YPT's newest co-op, Olivia, pictured here on World Theatre Day, 2017. April 24, 2017 / YPT / Comments Off on Meet Olivia! Our Community Volunteer Manager, Norah O’Donnell, sat down with our newest co-op student, Olivia, to ask her a few questions. I am a passion-filled, fun-loving 16-year-old from Oakville, who is extremely excited to be working with everyone at YPT! 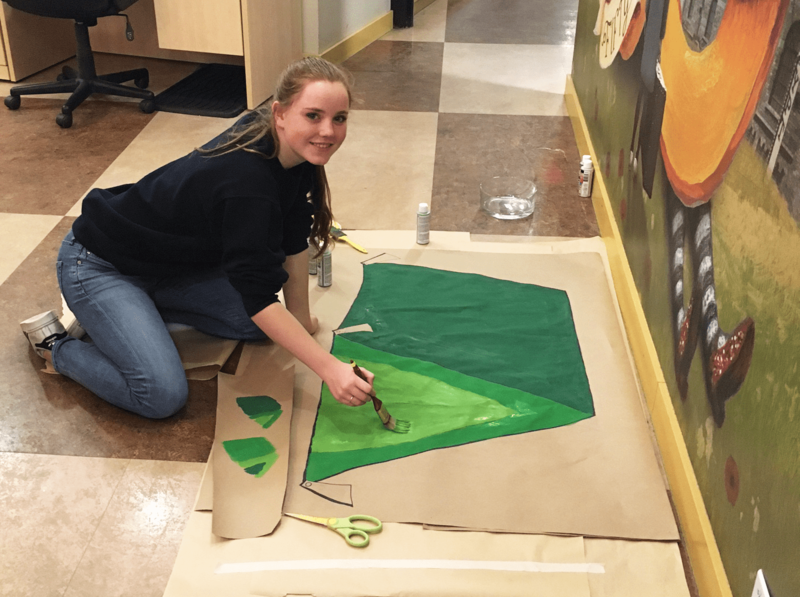 Olivia works on creating camp fire-themed decorations for the opening night of Munschtime!. Why were you interested in completing your co-op placement at a theatre? I was looking for a placement that would help me discover more about the theatre world. YPT seemed like it was a great fit and I am really interested in all the programs that are offered. Not to mention I love interacting with kids, so everything YPT offered aligned perfectly with what I was looking for. What is one thing you want to share about YPT? I’d love to share the amazing environment that YPT provides for everyone involved in the organization. Whether you are coming to see a show, volunteering, attending or a workshop, you can always count on being surrounded by a caring and inspiring group of people. Other than schoolwork, what keeps you busy? Right now I’m busy with a musical that I’m acting in. We are rehearsing for a performance of Into the Woods. I also take piano, vocal and ballet lessons, take part in my church choir, and I am on my school snowboard team. Other than that, not much – just hanging out with my friends and family. Grabbing supplies from YPT’s prop shop. Well, my mother is English, so she brought me up on a minimum of three cups of tea a day, so I am a tea fiend. Of course, there is also Netflix, which is a necessity for me. I always love a good binge of my favourite shows (which at the moment include The Office, Riverdale and That 70’s Show). Finally – and most importantly – I couldn’t live without my music, especially the Hamilton soundtrack that actually accompanies my walk to co-op. YPT is proud to offer student placements throughout the year. Our high school co-operative education program integrates students into the theatre environment, which helps them build essential skills that are transferable to many fields of study. 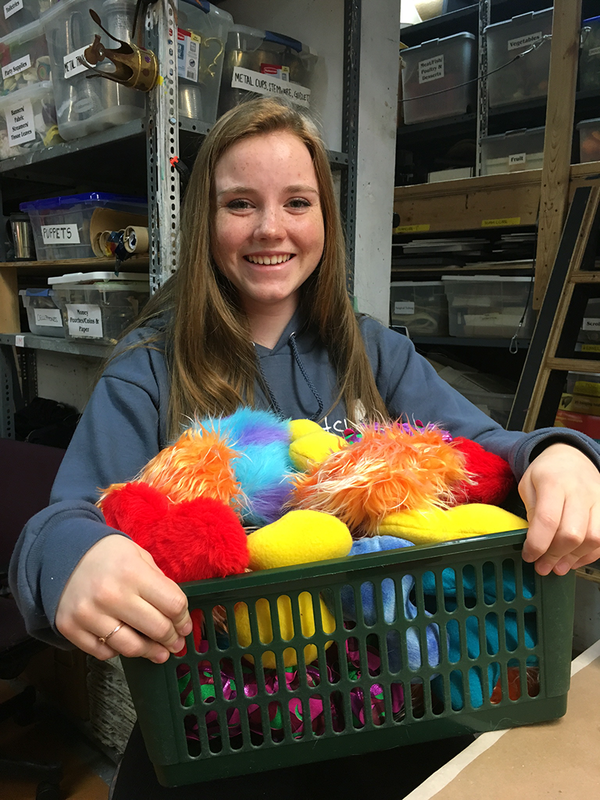 Students are often tasked with hands-on front of house duties, but they also have the opportunity to work in other departments in order to get a broader picture of the theatre as a whole. For more information please contact Norah O’Donnell at nodonnell@youngpeoplestheatre.ca or call 416.363.5131 x241.